IWB holsters are the most popular carrying implements for guns in the market today. This is because they make it much easier to carry a gun with you. They have been designed with the necessity of defense as a primary point of view. When you own one, you can be assured of convenience in retrieving your gun when you need it. It also ensures that you have somewhere for placing it back safely in its holster when not in use. In addition to this, these holsters are quite stylish for any kind of defense personnel. 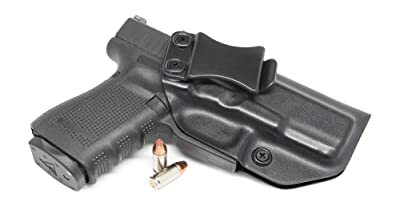 When you are buying a gun holster for Glock 19, the best IWB Holsters for Glock 19 should be your main starting point. Here are some that are worth considering. This is a very comfortable and versatile IWB holster. It is the best choice for anyone looking for a great looking gun holster that will serve them for a long time. This product is 100% leather and is able to fit Glock 17, 19, 22, 23, 26, 27, 31, 32 and 33. It has a comfortable backing plate that is made of lined saddle leather with its front made of Napa leather. This, combined with a very rigid Kydex holster pocket makes it very easy for the user to draw and holster their gun easily. It should be worn inside the waistband. This is because it comes with removable metal belt clips which can be moved up and down in the corresponding holes in the leather so as to allow the user to set the carry angle and height to suit individual preferences. The belt clips are made from metal. 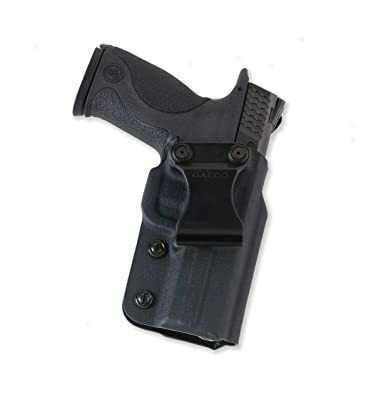 This increases the professional feel of the holster and makes it much sturdier. 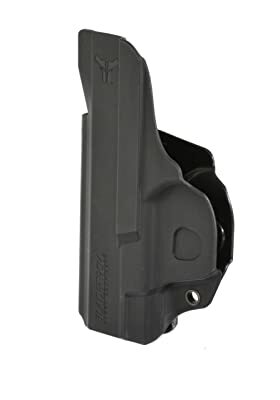 This right-hand IWB holster is good choice to consider. If you are looking for a great looking gun carrier to serve you for a longer time, this is it. It has been made from a highly durable Kydex that requires little or no maintenance at all. It is thin, fast and very easy to conceal since it is quite small. You can carry your gun without worrying about it being noticed. Its belt clip offers a fast on and off capability. You will therefore experience minimal delays whenever you want to use your gun or to holster it back. It has a sweat guard that is meant to protect the gun and the gun carrier from corrosive perspiration. The sweat guard is also meant to protect the user from the hard steel. You will find that this holster does not collapse once the gun has been drawn. This means that you can easily and quickly re-holster your gun in a swift motion. It requires a thicker and larger belt in order for the plastic clip to remain stable. If not, you will draw the gun together with the carrier when the time to use it comes. This is a great way to safely carry and conceal your gun for safety. It is ultra-thin, therefore very comfortable. This product is the best to use for people who want to maintain a low profile yet want to carry their guns just in case of an attack. It can help you carry your gun unnoticed even when you are dressed down. It has a signature Blade-Tech click. This will lock your gun securely into the holster and keep it there for as long as you want. The Blade-Tech belt clip will not only keep your gun in place but also allow for quick removal whenever there is need. 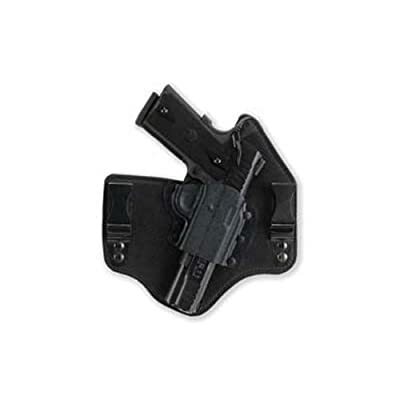 The gun carrier has been designed to be carried as a front strong side appendix holster. This is what allows for quick access whenever you need to defend yourself, whether you are a civilian or a law enforcement officer. Those who have safety features in mind will appreciate this holster. Once the pistol has been put in place, it cannot turn when placed upside down. Neither will it move out of position when it is shaken hard. 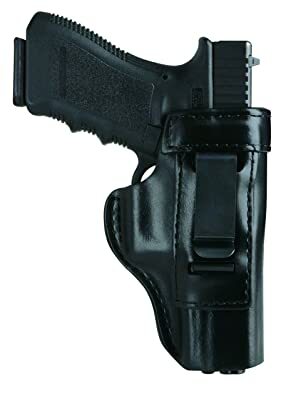 This is a great compact leather holster that is designed to provide the user with total inside-waistband concealment. The holster is made of high quality leather. He quality leather also offers the gun protection for scratch marks as well as getting scuffed. It is great looking too, thanks to the dye work and its rich black color. It will not only feel good to your hands but also grip your gun perfectly. This product is able to clip to pants as well as skirts and to a belt of up to 1¾ inches. It has an open top and it can fit SIG P230, P232, P238, Walther PPK, PPK/E and PPK/S. It is very comfortable too, holding the gun with just the right grip and at the same time allowing a fast draw from the concealment in times of danger. This can do the job quite well as it is possible to draw the weapon in a fluid motion. This gun carrier has been molded in order to fit an exact type of weapon. It is made of a minimal design, which leaves you with a compact and extremely light weight holster. The holster is easy to handle and carry for as long as you need to. It is in fact designed for everyday use. The holster is also designed for lifetime durability, in the best and strongest material. It is very easy to conceal your weapon using this kind of carrier. You can therefore still maintain a low profile as you also stay safe. It provides multiple carry options to suit the preferences of different users. These include the inside the waistband option, appendix carry and the small of back carry option. Whether you are a civilian that is just concerned about his safety or you are a law enforcement officer, a gun is important. This is in case you might want to defend yourself or someone else. Gun carriers need to be comfortable, of great quality and well fitting in order to keep your weapon in place. The G&G Inside Trouser Holster – B890 is a great choice of a holster to go for. If you are looking for a highly comfortable gun carrier that will serve you for a longer time, this is it. It looks and feels great on your hands, and it has been designed for durability.